After several weeks of uncertainty, Tribune Media has officially pulled the plug on its planned acquisition by conservative local TV broadcasting behemoth Sinclair Broadcast Group. Though Sinclair’s massive expansion plan is foiled, the company remains the largest owner and operator of local TV stations in the country and an increasingly popular friendly media platform for conservatives. And there are other local media battles on the horizon. On August 9, Tribune Media announced  it has pulled out of the embattled Sinclair-Tribune acquisition proposal and has filed a lawsuit  against Sinclair for “breach of contract,” citing the company’s questionable conduct that led to the deal’s slow-tracking. The announcement comes several weeks after the Federal Communications Commission (FCC) designated  the proposed acquisition for further legal scrutiny, citing possible “misrepresentation or lack of candor” by Sinclair. In the time since, Sinclair’s extensive record of shady business tactics  has returned to the spotlight. And as of late July, both Sinclair and Tribune, along with several other major broadcasters, are being investigated  by the Department of Justice for possible advertisement price fixing. The end of this proposed expansion is a huge victory for those who want local news to stay truly local, and especially those communities  who were set to see Sinclair take over their airwaves. But Sinclair is still a major threat to the future of local news. Sinclair currently owns or operates  192 TV stations in 89 different local media markets across the country. Even without the new stations it would have acquired through the Tribune purchase, Sinclair is still the largest owner and operator  of local TV stations in the country. It’s already actively inflicting plenty of damage to local communities using two tactics: consolidation and content. Sinclair’s M.O. for years has been to infiltrate media markets and consolidate news resources , making local news measurably  less local and more conservative. The company currently dominates numerous specific local media markets across the nation, using several types of legal maneuvers to own, operate, or otherwise control multiple top broadcast stations in a given place. There are at least 48 stations in 23 states  that aren’t owned by Sinclair but are operated by the company in some capacity. 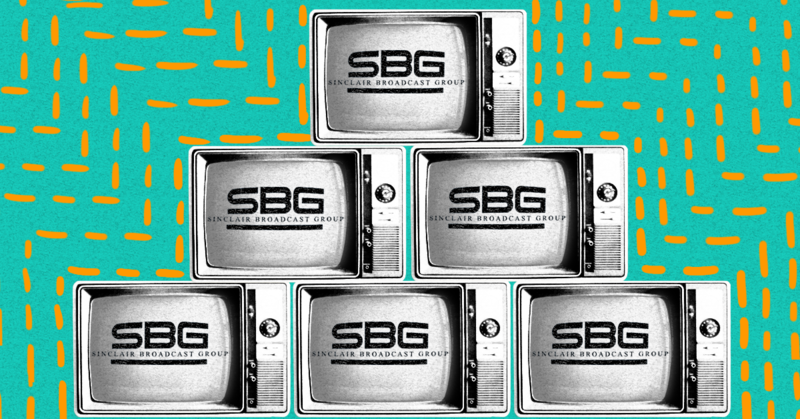 Through outright ownership and roundabout legal agreements, Sinclair manages to currently broadcast “must-run” segments on around 100 local news stations nationwide. These stations are forced to air, often during morning or nightly newscasts, pro-Trump commentary segments  hosted by former Trump aide Boris Epshteyn and regular “Terrorism Alert Desk ” segments seemingly designed to spur anti-Muslim xenophobia. Sinclair’s most well-known connection to the Trump administration is its “Bottom Line With Boris” series, particularly segments in which Epshteyn does friendly interviews with members of the Trump administration. At least seven administration officials  -- and Trump lawyer Rudy Giuliani -- have used Sinclair as a friendly media platform. In the last few weeks, Sinclair has mandated that its news stations air four  different  excerpts  from  Epshteyn’s recent interview with Vice President Mike Pence. Epshteyn’s blatant Trump propaganda is only a small piece of the much larger web  of connections between Sinclair and elected officials and members of the Trump camp. Trump has given exclusive interviews to Sinclair reporters at least 16 times, and Trump and others in his orbit have promoted Sinclair and its content. And though the Sinclair-Tribune deal has been shuttered, an internal investigation into Trump-appointed FCC chair Ajit Pai’s relationship with Sinclair may still be ongoing. In February, The New York Times reported  that the FCC inspector general has opened an internal investigation into potential improper conduct by Pai and his aides in pushing deregulatory measures  that have specifically benefited Sinclair. The investigation began after lawmakers  called  on the inspector general to investigate a “disturbing pattern of a three way quid-pro-quo” that could include a laundry list  of activities, beginning shortly after Sinclair’s top executive told  then-candidate Trump the outlet was there to “deliver [his] message” to America before the 2016 election. Sinclair began meeting  with current and former Fox News personalities while waiting for the Tribune deal to be approved, reportedly planning to develop a direct cable news competitor for Fox. It was developing ideas for a “three-hour block of news-opinion programming ” that could air  on a cable network Sinclair already owns or another it would have acquired in the Tribune deal. Even without the deal, Sinclair still has options for pursuing its cable news idea. In July, Buzzfeed News reported that Sinclair was developing  a free streaming app called STIRR that it could use to launch its Fox News competitor. And Sinclair bought Circa , an online news company, in 2015. Sinclair stations already typically link to Circa on their websites and sometimes run packaged segments from Circa on their local newscasts. And after a 2017 stint as the prime resource  for stoking Fox host Sean Hannity’s pro-Trump conspiracy theories, the outlet is now focused  on bringing Sinclair’s nationally produced news segments to a wider audience. Though it did sideline the Sinclair-Tribune deal, the Trump FCC is still very much in favor of media deregulation, and it’s poised to consider  another move that could help Sinclair and other large broadcasters homogenize local news. In conversations with Media Matters, representatives from media and consumer advocacy groups said a possible FCC reconsideration of what’s known as the national ownership cap , or national television audience reach cap, could be the next big local media fight on the horizon. Currently, the law specifies  that no broadcaster could own local stations reaching more than a collective 39 percent of U.S. television households. Changing this rule would give major companies like Sinclair the freedom to pursue other mergers and acquisitions currently restricted by the cap -- and it’s only a matter of time before the FCC makes a move. The commission gave public notice  back in December that it plans to reconsider the cap, and a long list  of broadcasters has already signaled public support for raising the limit. Sinclair, for its part, urged  the FCC to eliminate the cap altogether.